In 1994, the Brevard Zoo opened its doors as the largest community build zoo ever constructed. Over 16,000 people came together to raise money and make the building of Brevard Zoo a reality. The community has worked to create an incredible, one of a kind zoo experience that acts as a conservation hub, helping you learn more about not only the animals but what can be done to protect them and the environment. With unique visitor experiences, Brevard Zoo stands apart from the rest. How many zoos have you seen that allow you to kayak through their habitats? The Brevard Zoo is divided into five sections, with animals found in each region being represented there. There is Wild Florida with crocodiles, eagles, river otters and other animals commonly found in the state. As a Florida native, I love it when attractions feature information solely on our state, so that others can get a real feel for what is here. La Selva or the South American rain forest was probably the boy's favorite spot in the zoo. There were so many new and interesting animals to see, like the tapir. The boys were quite fascinated with the fact that two of them can produce 10 tons of poo in one year. Other favorite animals in this area included the caybaras with their adorable babies and tamarins who were pretty lively during our visit. Expedition Africa is where you can see crowd favorites like the giraffes, impala, and rhinoceros. Not only that, but Expedition Africa is where you can find many of the Brevard Zoo's hands-on experiences. Giraffe feeding is available for a small charge of $2 per cracker, or you can have a Rhino Encounter at a rate of $15 per person. Get an up close look at many of the habitats with a kayak adventure through this section of the zoo. Kayaking is $8 per person. The minimum age is 5, and anyone under 13 must have an adult in the kayak with them. The Austral/Asia section features some animals that I had never seen before too, like the black swan with its delicately ruffled feathers or the Southern Cassowary, the most dangerous bird with its razor-like claw. Another unique experience is available here for zoo visitors. You can feed the lorikeets and cockatiels for $1 each. 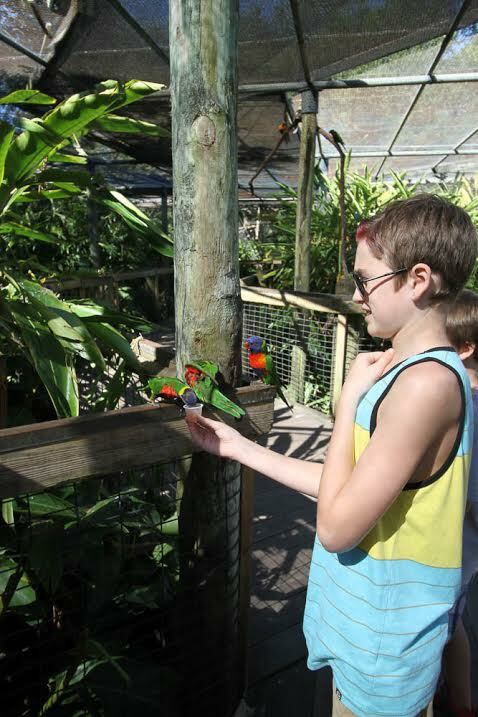 Joshua wasn't too sure about the lorikeets at first, but he eventually warmed up to them and loved the experience. Lastly, younger zoo visitors can have a blast with hands on activities and fun in the Paws On Play section of the Brevard Zoo. Here, you can find an animal petting area, aquarium, fort building section and so much more. The Brevard Zoo is open daily from 9:30 am to 5 pm. Admissions is $16 for adults and $12 for children ages 2-12. 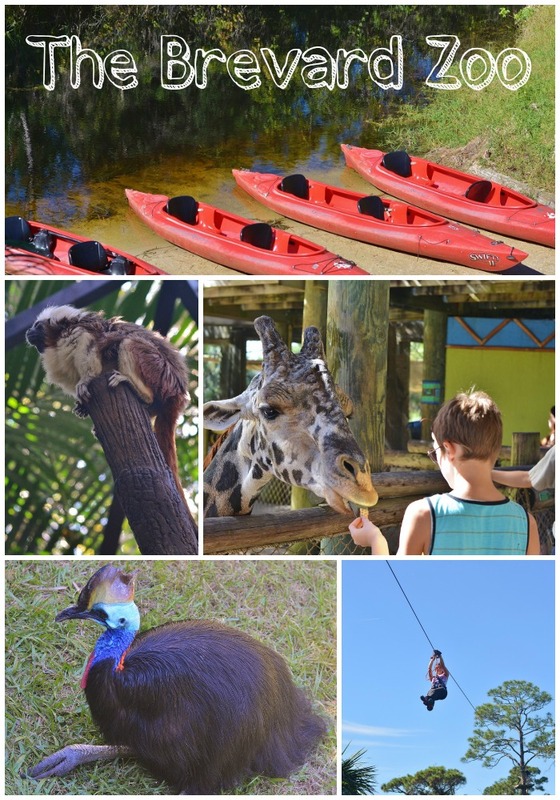 You can find more information about the zoo or how to book additional experiences like tree top aerial adventures, kayaking or paddle boats by visiting BrevardZoo.org. I was provided with admission to the Brevard Zoo for the purpose of review, all opinions are my own. Oh wow, that looks like an amazing and educational place to visit. Affordable too! What a fun day to explore the zoo with the family. I liked all of your photos especially the gators. Oh that's amazing! It looks like a lot of people love this place to have donated so much to save it. What a great story! Wow! Those are amazing shots. You really are up close and personal with the animals! I bet the kids loved the crocodile - ahhh.... He's too scary! You are right! That is one interactive animal experience! Glad you hand a wonderful time! Looks like an awesome zoo! I love unique animals! Wow. Such great pictures, so many animals! My daughter would absolutely love to visit this place.